Second day of out trip was the one I knew to expect the most. Both Gianfranco Pedersoli and Firmo and Francesca Fracassi were known to my by their books I had. Of all the engravings I’ve seen theirs was really the best. Pedersoli was my favorite, because of his style and design. Fracassis were my favorites, because of unbelievably fine bulino scenes. Their working styles are very different, but the class and result is really the best. 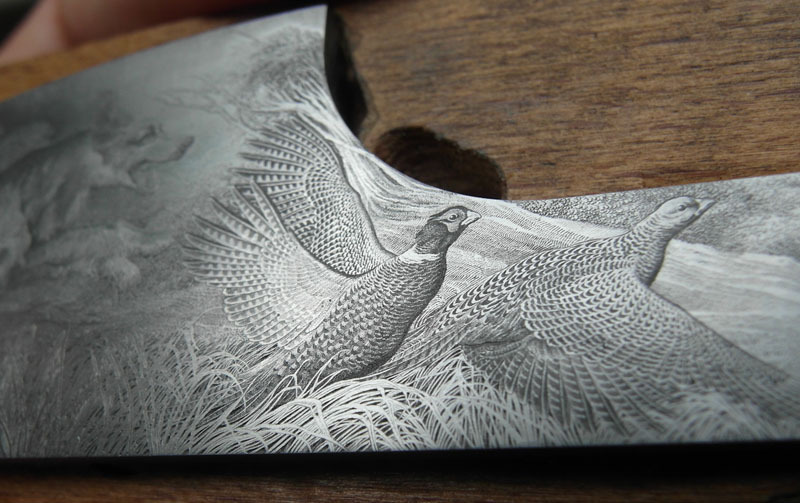 You can enlarge Fracassis work he’s done on 1×1 cm to 20×20 cm and it still looks amazing with all the detail. Pedersolis studio was also just a small room filled with books from floor to ceiling and his workplace was near large window. Just like almost all other engravers have. He is a very lively, friendly and passionate fellow, this shows also in his work. In his own words his engraving technique is very dynamic and he doesn’t have too much rules. Result and speed are important and he’s doing what needs to be done to achieve these. 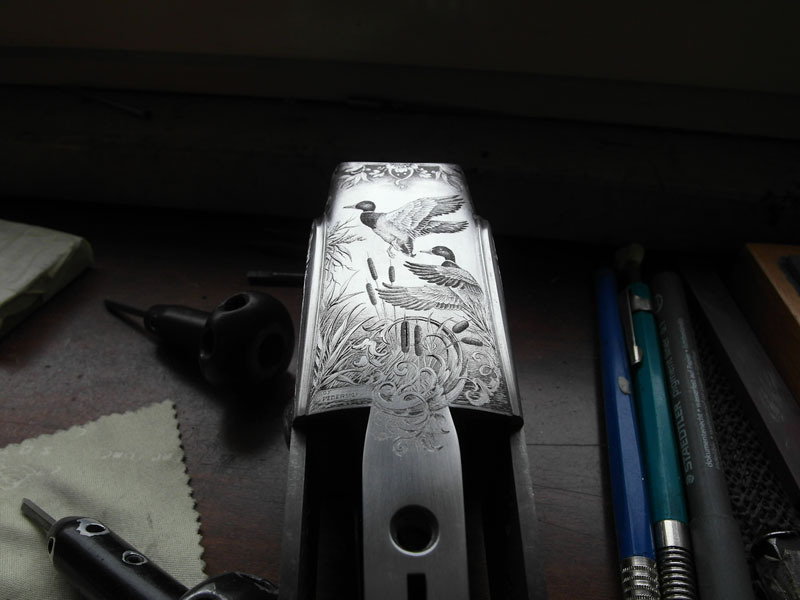 Most of the guns he engraves, take about 300-500 hours, which is indeed fast, considering the quality and detail of the work. Firmo and Francesca are father and daughter and since I got a book about them, I’ve wanted to see their work in real life, to really see how it looks and is the detail indeed that amazing as on the photos. That day was the day for these dreams to come true. Yes, their work is totally amazing in real life. Just incredible finesse. Their workplace is also very simple a large window facing north and 2 vises side by side. 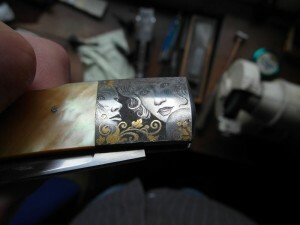 As they do only the finest bulino work, their only tool seemed to be small push graver. And stone for sharpening it. But I’ll let their work speak for themselves. Thei said that they work on almost all pieces together, one does one part, the other something else etc. All in all, that was a very-very interesting visit. Final visit of the day was to Mario Terzi. To tell the truth, I didn’t know much about him. I think I’ve maybe seen some of his works somewhere. 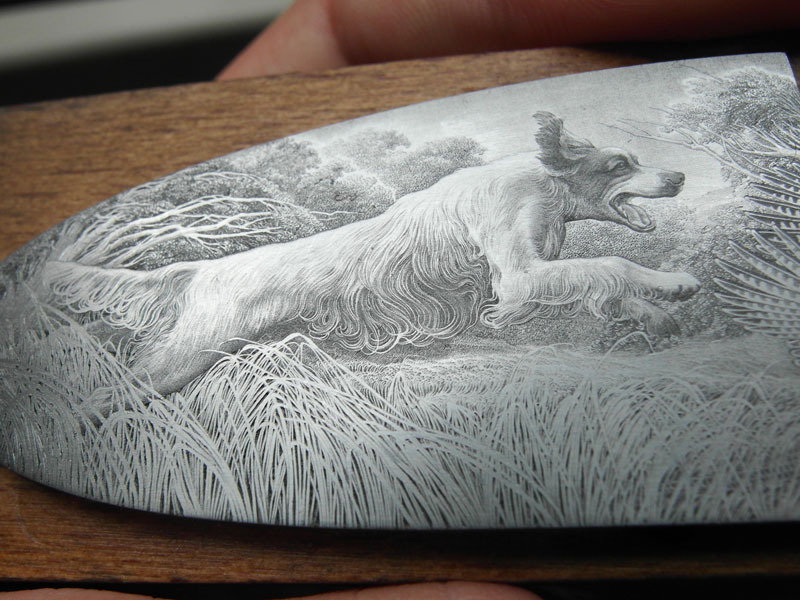 But as is the case with almost all Italian engravers, it’s very hard to find info and photos of their work from internet. 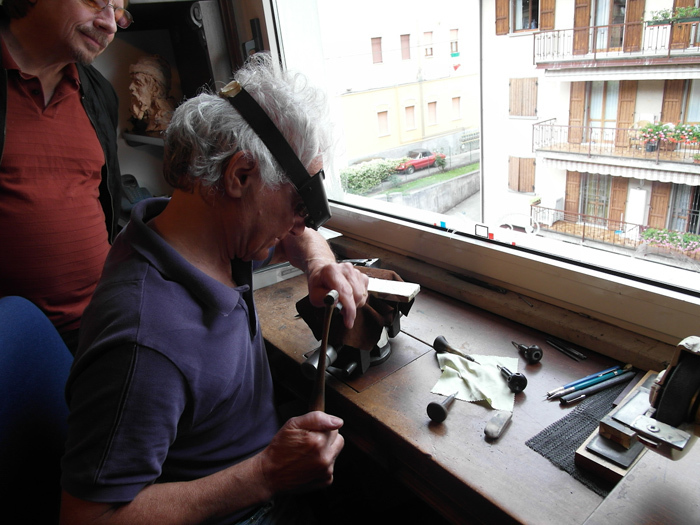 Of all the engravers we visited during that tour, his workshop was the most unusual. As all the others had large windows and used a lot of natural light, his shop was in a quite dark cellar and used only artificial light. He was a real art fan too, drawing and painting a lot, designing his own yard fences and of course his engravings were quite unique and very interesting. Unfortunately there weren’t any in-progress or finished works there at that day, so I didn’t take any photos. But hopefully soon a book about him will be released, so it would be possible to see his works from there.